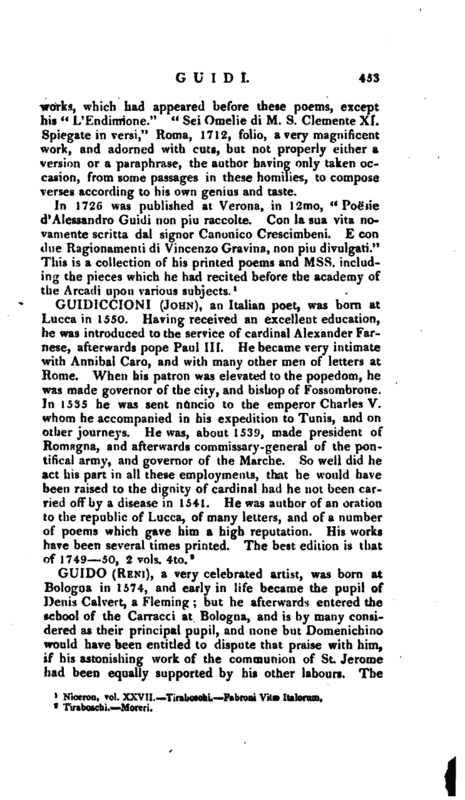 , a very celebrated artist, was born at Bologna in 1574, and early in life became the pupil of Denis Calvert, a Fleming; but he afterwards entered the school of the Carracci at Bologna, and is by many considered as their principal pupil, and none but Domenichino would have been entitled to dispute that praise with him, -if his astonishing work of the communion of St. Jerome had been equally supported by his other labours, The | Carracci, however, were too jealous to rejoice in the extraordinary progress of Guido, who threatened to rival at least, if not surpass, their own claims to public applause, and Ludovico disgracefully attempted to depreciate his pupil by opposing Guercino to him, while Annihal himself js said to have censured Albani for having conducted Guido. thither, alarmed at his aspiring talents, his graceful man-, ner, and ambitious desire to excel. 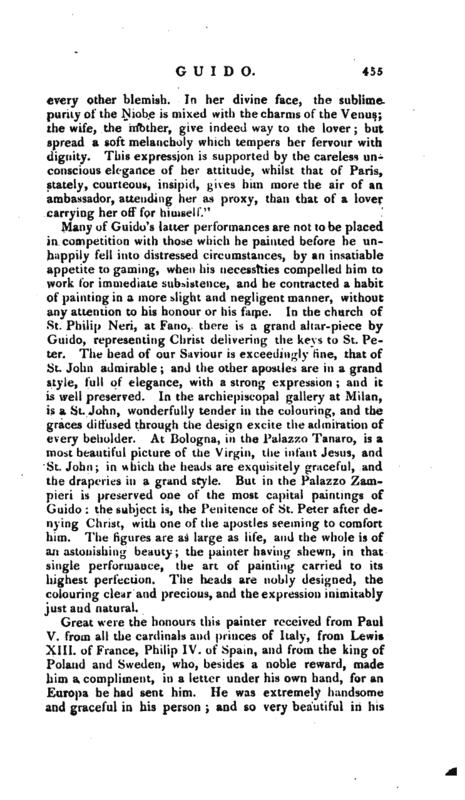 Many of Guido’s latter performances are not to be placed in competitionwith those which he painted before he unhappily fell into distressed circumstances, by an insatiable appetite to gaming, when his necessities compelled him to work for immediate subsistence, and he contracted a habit of painting in a more slight and negligent manner, without any attention to his honour or his fame. In the church of St. Philip Neri, at Fano, there is a grand altar-piece by Guido, representing Christ delivering the keys to St. Peter. The head of our Saviour is exceedingly fine, that of St. John admirable and the other apostles are in a grand style, full of elegance, with a strong expression and it is well preserved. In the archiepiscopal gallery at Milan, is a St. John, wonderfully tender in the colouring, and the graces diffused through the design excite the admiration of every beholder. At Bologna, in the Palazzo Tanaro, is a most beautiful picture of the Virgin, the infant Jesus, and St. John; Jn which the heads are exquisitely graceful, and the draperies in a grand style. But in the Palazzo Zampieri is preserved one of the most capital paintings of Guido: the subject is, the Penitence of St. Peter after denying Christ, with one of the apostles seeming to comfort him. The figures are as large as life, and the whole is of an astonishing beauty; the painter having shewn, in that single performance, the art of painting carried to its highest perfection. The heads are nobly designed, the colouring clear and precious, and the expression inimitably just and natural. 1 Argenville, vol. 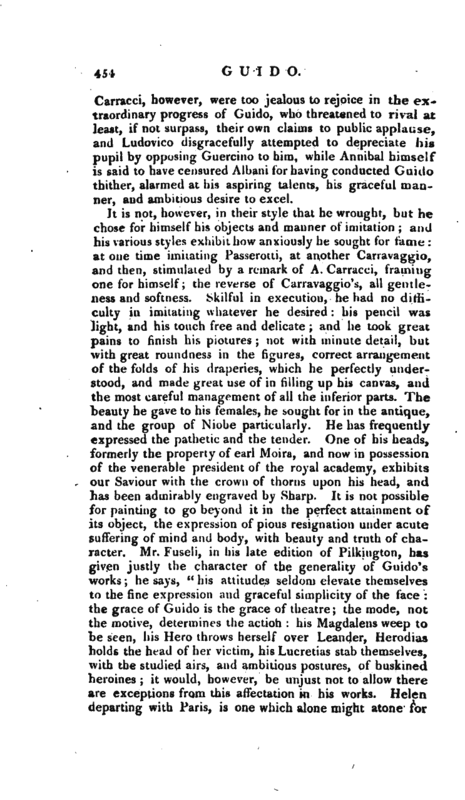 II, PilkJDgton.^-Rees’s Cyclopædia. 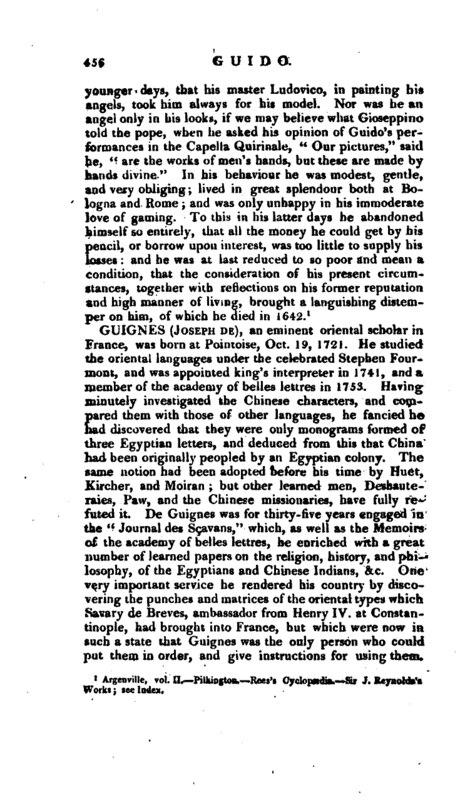 Sir J. Reynolds’s Works; see Index.